The library will be open until 3:00AM. Study party! 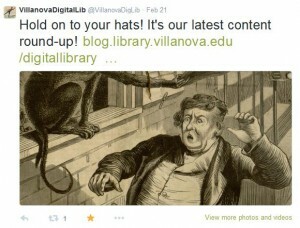 Don’t miss the Villanova Digital Library content round-up! 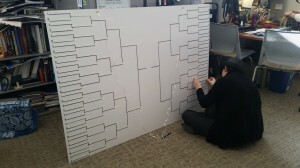 Outreach intern Kallie is a profesh taper. You’ll never see cleaner blank spaces (sorry, T. Swift)! Hint: these March Madness Matchups might make your stomach growl. Look for the voting board by Falvey’s entrance right after Spring Break. Nom! If you give our page a like on Facebook, you’ll be so in the know. Not only do we share links to all the goings-on of our blog, but we also post announcements and share very cool content from all around the internet!